In placing second, the quartet had a time of 44.05 seconds, to erase the 44.34 mark they established in 2010 on home soil, in beating St, Kitts-Nevis, the Organization of Eastern Caribbean States (OECS) record holders. 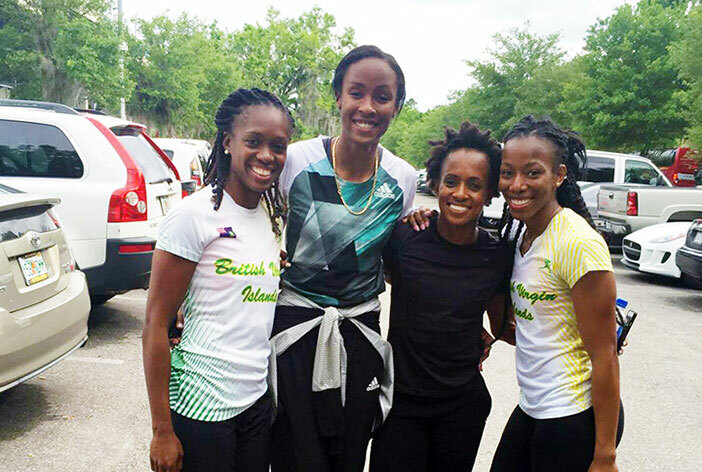 Their mark is the third best ever recorded by an OECS squad behind St. Kitts-Nevis’ 43.52 and 43.98 from 2009. In individual competition, Malone won the Long Jump with a leap of 6.43m, while Harrigan-Scott had a season’s best of 11.34 seconds in the 100m. Kelly lowered her five-year old 100m best from 11.61 seconds to 11.58, and moved from No. 5 to No. 3 on the territory’s All Time List. King ran her 200m in 23.97. St. Augustine’s Jr. Khari Herbert, was second in the CIAA Conference Championships 400m with a season’s best 46.95 seconds, after advancing with 47.17. He anchored the 4x400m Relay to a second place finish in 3 minutes, 12.39 seconds in helping retain the conference title with 203 points. At the Triton Invitational in San Diego, twin sisters and Central Arizona sophomores Tynelle and Trevia Gumbs, had marks of 50.18m and 47.58m respectively in the Hammer Throw on Friday. Tynelle then threw the Discus 39.83m and Trevia, 39.69m. In Saturday’s action, Tynelle had a disappointing mark of 34.05m in the Javelin while Trevia recorded a season’s best of 13.48m in the Open Shot Put.